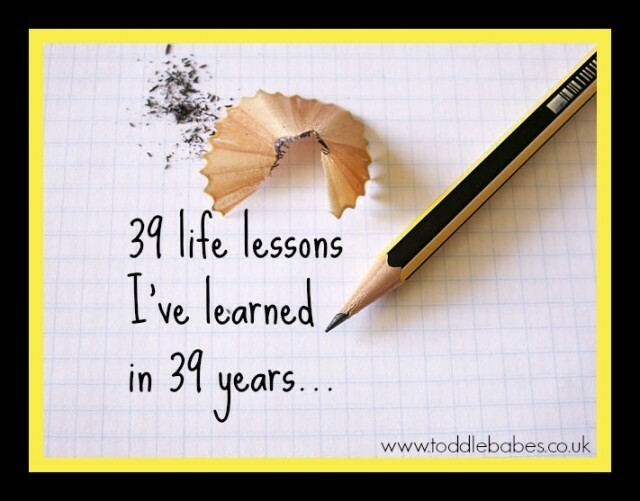 Yes, I realise that 39 things in 39 years makes me a slow learner, but hey…It means I’ve had time to really ponder it all! These are the things I feel are worth mentioning. I’m pretty sure that there are many more, perhaps for another post one day..but for the moment here’s my list. People come into your life for a reason, some stay, some go , some you need to get rid of (you know the type). I’ve noticed through time that people come in and out of your life. Sometimes they are there for a short while and sometimes they are just passing through. I believe each serves a purpose. Some are there just for a season-another mother with a small child you can identify with, someone who shares a common interest…some to teach you something. Outdoor space and living restores the soul; grow a garden, walk in the woods, go to the beach. I truly believe that spending time in nature and being more in tune with nature feeds your soul. We moved to the countryside 5 years ago and I can definitely say that though I sometimes miss the vibrancy of the city, I feel more at ease, and at home in the countryside. I really love digging in the soil and watching my garden come to life each spring. Driving, cycling or walking along the roads and pathways gives me a sense of peace I can’t find anywhere else. Children make you see the world differently-look at it with their eyes.. Take the time to look at the world afresh. See the small things and pretty things in your environment. Notice the bugs, creatures and birds. Stop to smell the flowers and collect twigs. Feel the rain on your face, the wind in your hair and the sand between your toes. These “small things” are actually huge; and important. They give me a sense of self and belonging…and it’s fun to relive childhood! Loving yourself is more important than loving someone else. Take time to know yourself..figure out what you love and what makes you happy. Really getting to know yourself will ensure that you put your best self forward, that you are strong enough to handle any situation and to remain to true to yourself. Look after your physical and mental health. Take time to exercise, eat right and balance yourself emotionally and spiritually. In our often hectic lives, taking the time to come back to yourself will keep you grounded and lessen stress. Your body is capable of amazing things. Try things. Trust that your body can handle it. Exercise, push your limits. People can change but you can’t make them change. Don’t try to change people. You CAN’T do it. And you shouldn’t try. It will only lead to resentment, anger and frustration..all things you can do without! You can however change yourself and you can support others who want to change. Spending time with each other is more valuable than spending cash. Material things come and go…they bring joy for short periods of time. They are finite. Time is like making a deposit into your bank account. Children especially respond to time shared; and they crave it. Build those memories together, feel the connection between you grow, get to know each other more deeply. Your parents love you more than you realise. Since becoming a parent, I have realised how intense a parent’s love can be. I am fiercely protective of my children. I would do ANYTHING for them. I want to breathe them in when I hold them. I want their cuddles and kisses. I am happiest when I have my children with me. RAK (Random Acts of Kindness) are good for your soul. I prefer giving than receiving. I enjoy doing things for others. I like the feeling it gives me to see the joy or appreciation of the recipient. Kindness is the easiest thing to give away. Really listening is worth more than anything else you can offer a friend. Sometimes all you need to do to brighten someones day is to stop, take the time to listen. Really listen. Not advise, not help, not share your experience. Just listen and let them off load. Learning never stops, thirst for knowledge..read, watch, do. You are never to old to learn new things. Some people are toxic, even if you think you should be friends…cut them off…you will feel lighter and freer. Hugs can make just about anything more bearable. Hugs area a wordless way to show support, love, friendship, empathy, and sympathy. Working hard is good, but working clever is better, put in less time but be more efficient. Find ways to do improve your productivity. Working lots of hours does not mean you are working harder. Anger damages your health and your relationships..say sorry, resolve issues-don’t walk away still angry. Pick your battles, let it go…don’t sweat the small things…give it time and you’ll be wondering why it even bothered you in the first place. Moderate exercise is good for your body and soul. You don’t have to be a fitness nut. Just move. Your body will be stronger, healthier looking and endorphins make you happy! You are unique and special. There is no one else the same..so why lose your rarity by trying to be like someone else? Laugh more, it makes you smile, which makes other smile. It’s good tummy exercise and lifts your mood. Gluten and sugar are not good for you. Cut them out! You’ll feel better for doing it. Everyone has stress..even kids, Stay At Home Mothers, working parents… People stress over money, relationships, family, kids, friends,any many things you are not aware of. Show empathy and understanding..don’t fob it off with -what could you possibly have to be stressed about? Stand up for yourself, don’t be a doormat. Say NO and mean it. Say I love you often..people need to hear it and feel it. People are not mind readers, tell them what you need. Only you can share your needs. Waiting for others to figure it out only ends in frustration and irritation. Get involved- be part of the solution, don’t complain. I hate when people stand around belly-aching about how things are and how much they hate a situation. If you don’t like it, stop moaning and become actively involved in finding a solution. Volunteer and serve in your community, or child’s school. You can make a difference, but not by moaning! Save your memories-Take the time to scrapbook, take photos without fail and organise them. You will be grateful you did when the years have flown by and you are able to take a visual trip down memory lane. Learn from your past..don’t be bitter about it..look at what was good, what was bad..and take the positive from it, toss the rest. Take criticism graciously and learn from it. View it as a way to improve yourself..let it build you up, not break you down. Be willing to try new things..we are the sum of our experiences…make yourself the best you you can be by getting out there, being brave and trying things out! Make the time to reach out to others…send notes, texts and write emails. Or even better handwritten notes and cards can make a person’s week…it takes 2 minutes and the feeling it gives lasts the recipient way longer. You’re not always right, accept it, acknowledge it and move on. If it’s not useful, beautiful or precious, throw it out…clutter weighs you down. Don’t just talk the talk, walk the walk. Live by example, be a role model to your children and others. Your children are only little until about age 10. Before age 3 they are not really aware of much which means they only have about 7 years to have childish fun. Resist the temptation to spill the beans about the existence of the tooth fairy, Santa, Christmas Elves and other magical childhood traditions. Weather is just weather, don’t let it ruin your day..adapt and get on with it. After all, you’re waterproof and your clothes will dry. Don’t try to keep up with the Joneses, chances are they are not happy with what they have either. Make your space as lovely as you can within your means. Don’t take yourself too seriously. Make your plans, follow your dreams and take it one day at a time. Remember to have fun along the way. Well, that’s it. I hope you enjoyed reading my life lessons as much as I enjoyed writing them. Did you identify with any of them? I’d love to hear what life lessons you think are worth sharing too.